The Rochester Red Wings unveiled a specially designed jersey and baseball cap with “Red Wings” embroidered in American Sign Language in commemoration of the first Deaf Culture Day at Frontier Day on April 28. Pictured here, from left to right, Antony McLetchie, superintendent, Rochester School for the Deaf; Gerry Buckley, NTID president; Naomi Silver, president, CEO and COO, Rochester Red Wings; and Dan Mason, general manager, Red Wings. In front, Ritchie, left, and Spikes, the Red Wings mascot. 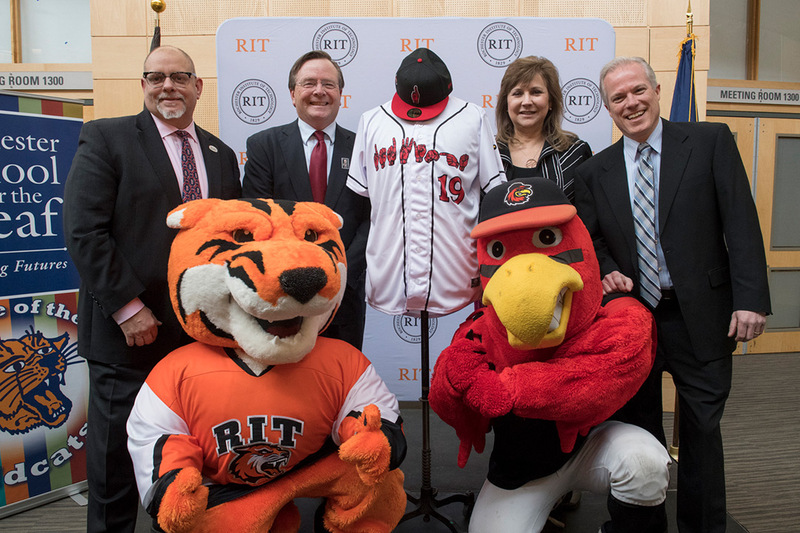 The announcement on March 5 at RIT/NTID featured Red Wings officials, administrators from RIT/NTID and RSD, student athletes, and mascots Spikes from the Red Wings and Ritchie from RIT.